Emergency meals aren’t necessarily everyday fare, but they’re made from everyday things. The whole idea is to deploy these when Plan A fails spectacularly. Having a backup plan gives you the advantage of going to bed feeling smug at how genius you are for always being prepared. 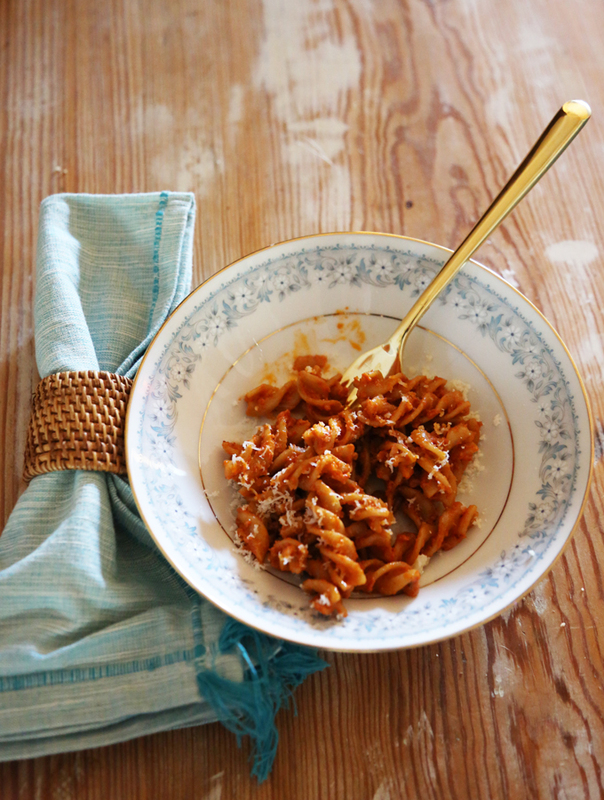 It pays to always keep a box/bag of pasta in the pantry. It really comes in handy when I need a last-minute emergency meal that requires basically zero effort. If you have milk and flour (and who doesn’t?) you can make a nice cream sauce. All you need is a can of tomatoes and you’ve got dinner with this delicious and simple marinara. I like a combo… a creamy tomato sauce. This is very simple to make with ingredients you most likely have (or should have) on hand. I recently tried my hand at a vodka sauce (look for the recipe at the bottom of the post). It was way easier than I had anticipated and it takes your pasta to the next level. It may be the rare emergency meal/regular rotation unicorn! Next time you make rice, make extra and follow these simple steps to make the best at-home fried rice that beats take-out any day. I make this salad a lot for my girlfriends, and it’s perfect in a pinch. There isn’t a “recipe,” as it changes each time I make it depending on what I have in my fridge. There a few musts, though, and I’m pretty firm that they’re non-negotiable. I started making this salad after having it at a local restaurant. The combination of the crunchy grapenuts and the soft goat cheese really makes it unique. Use your favorite greens (I prefer spinach but I encourage you to get crazy) and check your fridge for any veggies or fruit you have available. Chop them all into bite size pieces. No matter what combinations you come up with, it will pair perfectly with this red onion dressing you should already have on hand because it’s so delicious and versatile. Heat the 1/4 cup of oil in a large pan over medium-low heat. Add the shallot and garlic and cook, stirring occasionally, until softened (about 5 minutes). Next, add the tomato paste and cook, again stirring occasionally, until the paste is brick red and starts to caramelize (about 5 minutes). Add vodka and cook, stirring constantly this time, until liquid is evaporated (about 2 minutes). Add cream and red pepper flakes and stir until well combined. Season with salt and pepper and remove from heat. Meanwhile, cook pasta in a large pot of boiling salted water, stirring occasionally (until al dente). Drain, but reserve 1 cup pasta cooking liquid. Add the pasta to the skillet with sauce along with butter and ½ cup pasta cooking liquid. Cook over medium-low heat, stirring constantly and adding more pasta cooking liquid if needed (until butter has melted, about 2 minutes). Season with salt and pepper and add Parmesan. Stir. Divide pasta among bowls, then top with Parmesan and basil (if using).